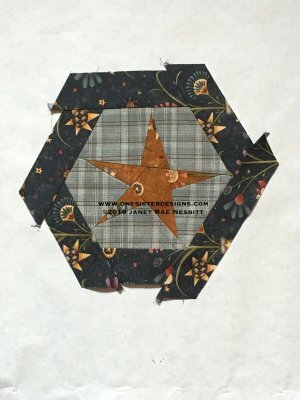 This demo is to help explain my crazy piecing technique, and is for the hexagon star quilt, Sparkle, from the Absolutely Crazy book. For purposes of this demo, I will make the smaller table top version, similar to Christmas Sparkle. 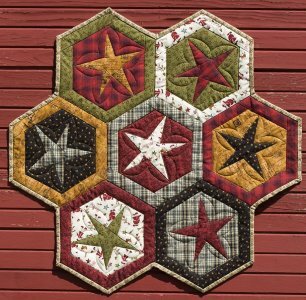 Begin by counting the number of elements in each block: for this block, you have one- the star, two- the star background, and three-the hexi border, for a total of three different fabrics in each block so every three fabrics need to contrast. This method helps you be scrappy! 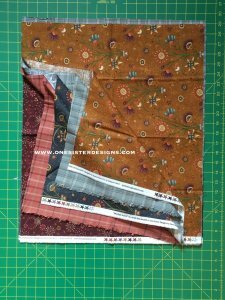 As you look at this stack of fabric, the blue gray fabric at the top of the stack will be pair with the purple check and red flower. 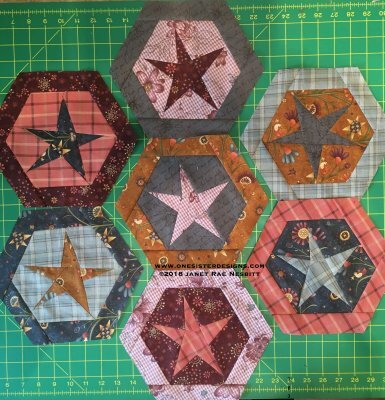 Then the next block will be the purple check paired with the red flower and the pink plaid. The third block will be the red flower, the pink plaid, and the blue/gray floral. And so it goes, every three fabrics together in a block. 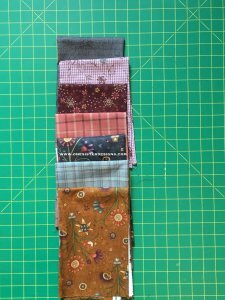 Because of shuffling, the fabric on the top of the stack must contrast with the TWO fabrics on the bottom of the stack, in this case the gold floral will be paired with the blue/gray solid and the purple check. Also the top TWO fabrics, the gold and the blue plaid, will be paired with the bottom ONE, the blue/gray solid. Once you have the fabrics arranged how you'd like them, stack your fabrics in a pile, right sides up. 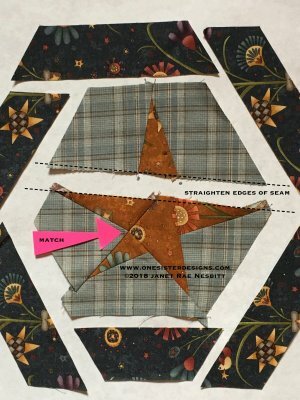 As you stack, try to align two sides, the selvage and the left side of each fabric. 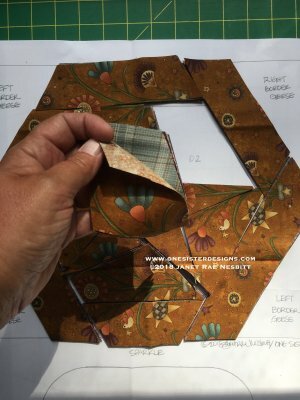 Cut around the outside of the pattern, cutting through the freezer paper and the entire stack of fabric. Continue cutting saying your alphabet backwards and counting backwards to determine the cutting order. 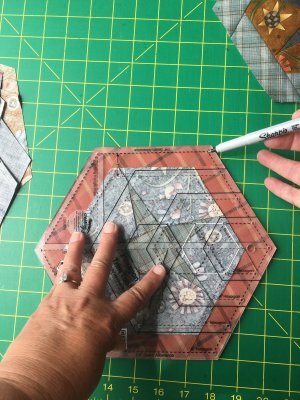 As you cut out each piece, stack them on the master to help you stay organized and keep pieces oriented correctly. Once all the pieces are cut and stacked on the master, it's time the shuffle! 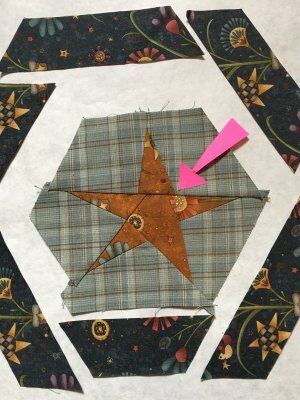 Each of the pieces to be shuffled will be listed in the instructions; beginning with the star background pieces, you will pick up the entire pile and put the top gold fabric on the bottom so the blue plaid fabric is showing for the star background. 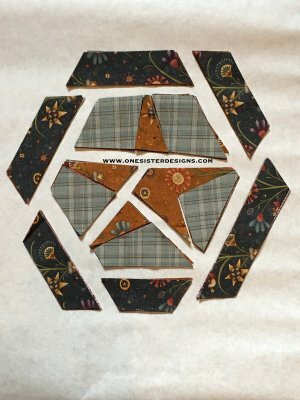 For the hexi border, you will pick up the entire pile and put the top TWO fabrics on the bottom so the blue/gray floral is showing for the border. 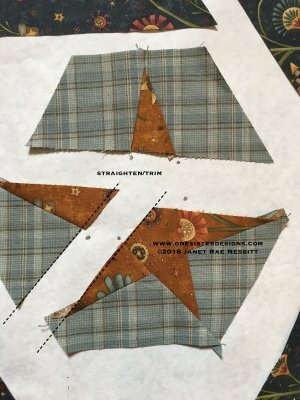 The star fabrics stay the same. 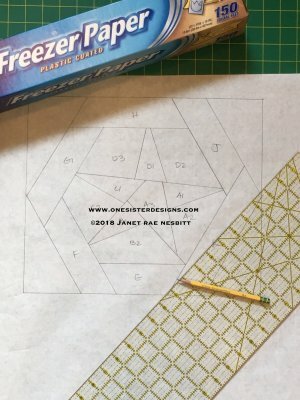 Once you are all shuffled, be sure to take a minute and check to make sure it looks like it should, and that you haven't missed shuffling any pieces. Then, separate the block slightly into it's sections A-K. Each section will be stitched back together piece 1 to 2 then add 3 etc. Notice on the master that there are dots to indicate where you should try to have an accurate quarter inch. 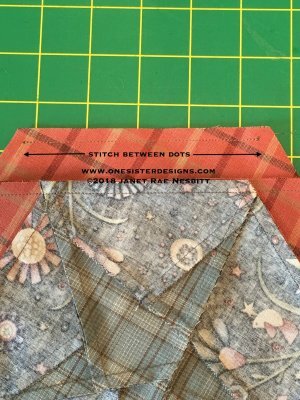 Just pick up the two pieces to to stitched, look at the seam line between them to see which end the dot is at and that is where you will try to maintain an accurate quarter inch. Don't worry if the other end isn't even after stitching! This minimizes the amount of fabric you trim off and you will have better results! If there aren't any dots, just center one piece on the other and stitch. 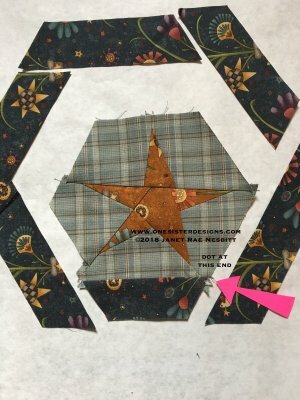 So when stitching A1 to A2, you will try to keep the seam line straight along piece 3 where the dot is so that you can add piece 3 without having to trim any excess fabric. At the dots, you will generally have to have a dog ear sticking up. It can be difficult to decide how large of of a dog ear to have. 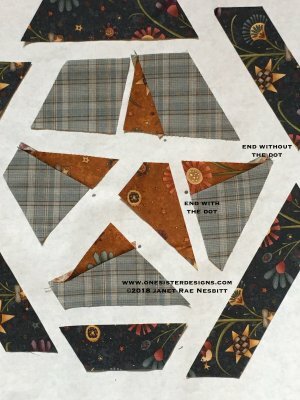 You want your stitches to go exactly through the point where the two fabrics intersect- think: at the Y. This illustration attempts to show you my Goldilocks rule: instead of being too hot and too cold, you want the dog ear to be just right! The dog ear at the top is too large, and the middle dog ear is too small, but the bottom dog ear is just right since the stitching goes right through where the two fabrics meet. You will be following this rule where ever there's a dot! 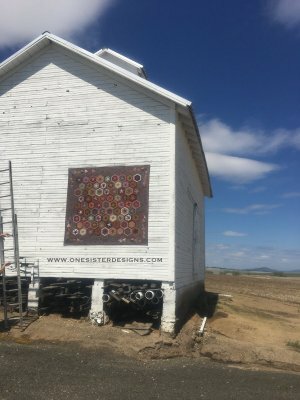 This photo shows all of the piece 2's stitched to the piece 1's. Notice the the edges are straight at the ends with the dots and there is extra at the end without the dots- that's the way it should be! 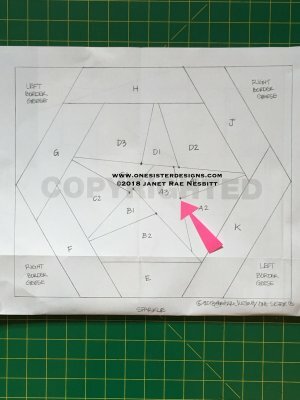 This photo shows all of the piece 3's stitched to the piece 1-2's (for those sections with a piece 3). Notice the the edges are straight at the ends with the dots and there is extra at the end without the dots- again, that's the way it should be! 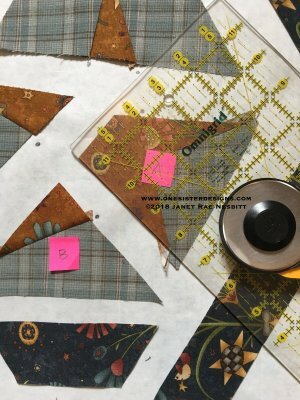 Now that each of the sections are pieced, it's time to stitch one section to the next in alphabetical order, section A to section B, then add section C etc. 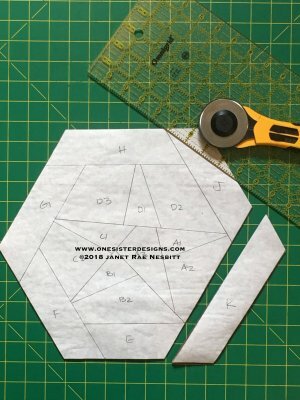 After each section is pieced, then the sections are generally stitched together in alphabetical order, but the specifics for each pattern are always in the instructions. It is VERY IMPORTANT that when stitching one section to another, you straighten the seam before you stitch, taking off the least amount. Generally the portion you are trimming off will be parallel to your ruler so you know it's just seam allowance. 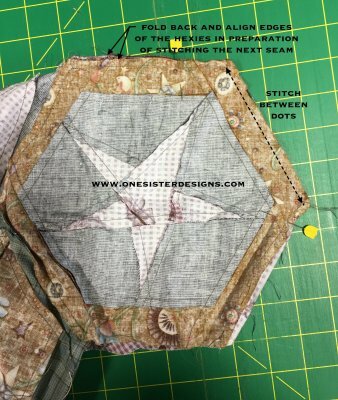 If for some reason, you have a funny angle sticking out, go back to your master and check to see if you twisted a piece before you stitched: DON'T JUST TRIM IT OFF!! 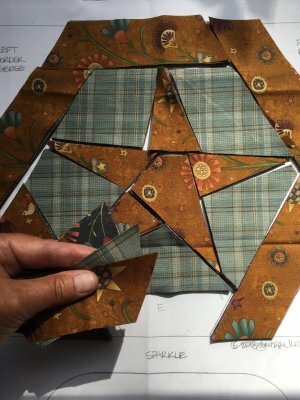 Progression as sections are stitched together: details of what to match or where to align are always written in the instructions! 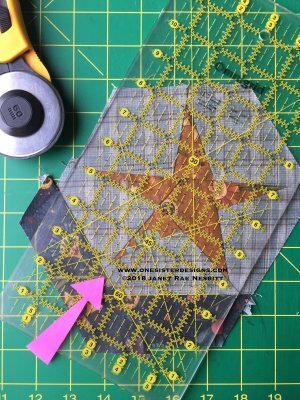 As you straighten the edge of the seam in preparation to add border piece F, you will also align the 60º mark on you ruler with the previous seam as shown. 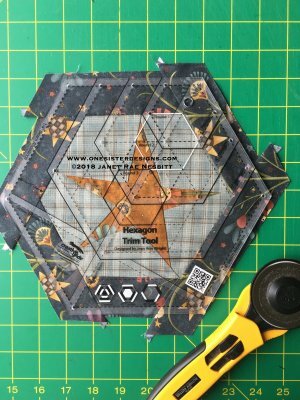 This will help your hexagon to maintain is shape since hexagons are made with 60º angles. Notice that the edge of portion you are trimming off is still approximately parallel to your ruler! Continue straightening in this manner until all the border pieces have been added. Yes! This is how is't suppose to look! 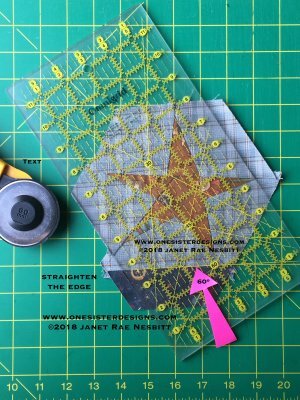 Now just place your 8-1/2" hexagon trim tool on top of each block, using the lines on the ruler to help center the inside star, and trim all the way around! 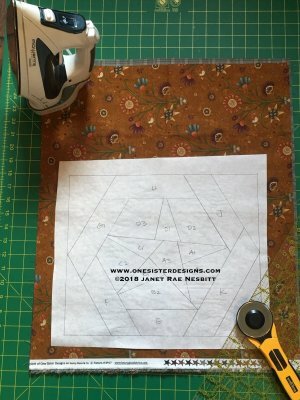 In preparation of stitching the blocks together, mark the 1/4" points in each corner of the hexagon on the wrong side, using the holes in the trim tool. Lay the blocks out in vertical rows. Stitch the blocks together in vertical rows stitching between the dots. 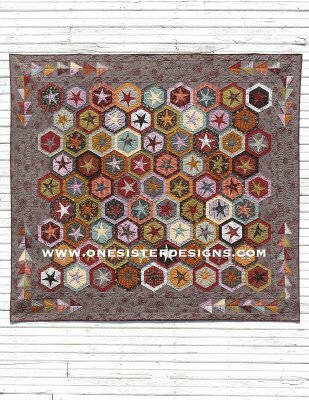 The rows will be stitched together in a zig zag fashion, again only stitching between the dots. 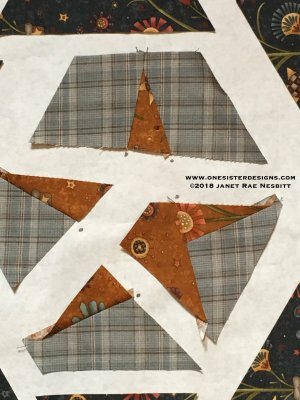 The quilt needs to be removed from the machine after each seam in stitched so the next seam can be aligned prior to stitching. Fold and align the edges of the in preparation of stitching the next seam.